to get some crafting in. 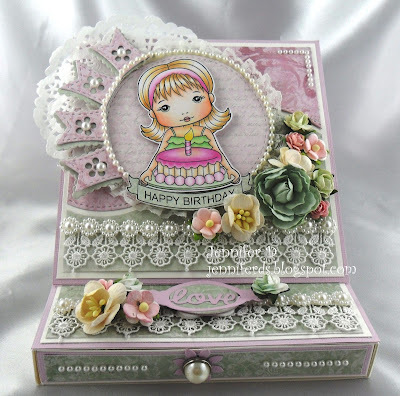 I have an Easle Card Box Tutorial for you today. Put strong tape on one end of each. To make the box cut one 17.8cm x 17.8cm and score 2cm on each side. Pop a small cut in each corner as in the picture. The box fits in the sleeve. To make the Easle cut one 14cmx14cm. Cut one 28cmx14cm and score at 7cm and 14cm. Fold as in the picture. Tape the Easle on the base. Tape the Easle Card on to the Box Base. Then decorate as desired. I cann't wait to see your creations. What a darling project. I love how you embellished it. Must give this a try. I have added this to my favourites and definitely going to have a try..thanks for the tutorial and the end result is just beautiful. Cute project. Now I am off to find a conversion table to find out the measurements in inches. Inspiration Wednesday - For a Friend!